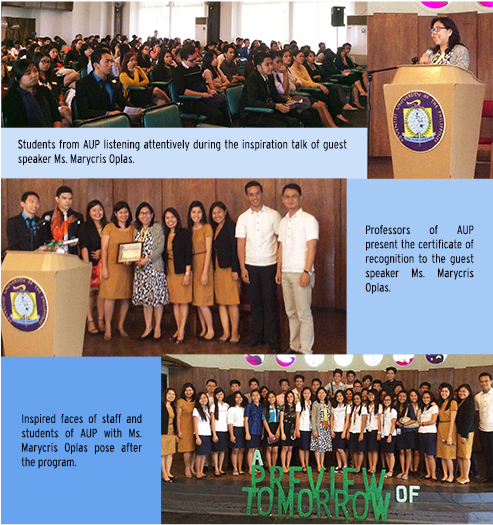 MS. MARYCRIS S. Oplas, Senior Managing Partner of Alas Oplas & Co., CPAs was the guest speaker during the Adventist University of the Philippines’ (AUP) Accountancy Annual Round Table Discussion held last January 30, 2015. Following this year theme “A Preview of Tomorrow”, Ms. Oplas presented the Firms’ Career Action Plan for Accountants to about 200 students who participated and witnessed the annual event of the university at Silang, Cavite. Being in the practice for over 20 years, Ms. Oplas also shared her experiences in the profession especially during the audit season. “It’s not easy because audit is so tiring, audit is so stressful… but all jobs are stressful, it’s how you handle it, promote positivity amidst difﬁculties and regain your love of work” said Ms. Oplas.